Thanks to dropping storage prices, speedier internet, and slicker software, you’ve now got a plethora of choices when it comes to keeping your files in the cloud, safe from harm and ready on demand. Yet there are a lot of different services, and while they can all handle your storage needs, they are not all created equal. Some work better for photo fans, while others are a better option if you’re hoarding thousands of MP3s. 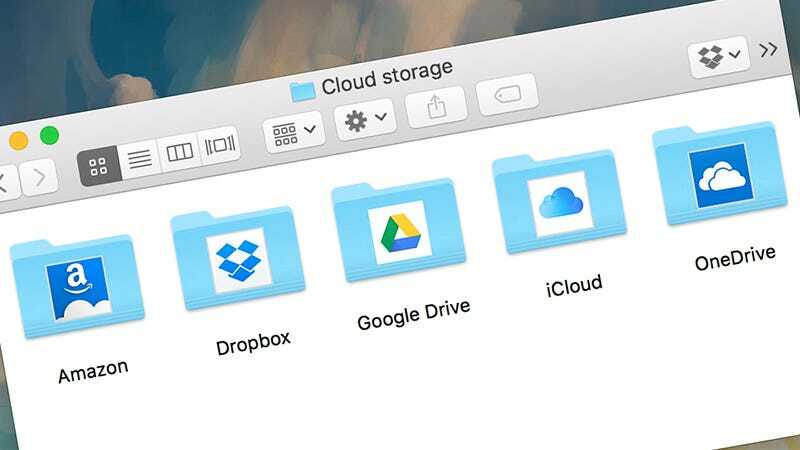 We’ve been putting them to the test to find out their strengths and weaknesses, and, broadly speaking, they’re all more than adequate for your simple cloud storage needs. Each will hold onto a few gigabytes of files and let you access them wherever you have internet access. The competition. For services that only offer annual subscriptions, we’ve calculated the equivalent monthly cost. Yet, depending on your particulars circumstances, only one will rise above the rest. At just $50 for 10TB, Amazon Drive remains a bargain for people with loads of data, even if it is now shuttering the unlimited storage option that’s been offered for a couple of years. As usual, Prime members get the best deals: unlimited photo storage in this case. Though that doesn’t include videos, it does make the service more tempting if you’re on Prime anyway . Still Amazon doesn’t offer the best user experience—yes the apps all work as advertised, but from functionality to reliability, other options have Amazon beat. Only videos under 20 minutes in length can be streamed from the cloud, for example, one of a few annoyances which stops us using this service regularly—it’s also not the most polished when you actually try and interact with it. There’s no online office suite, no smart photo organization or editing, and a buggy interface to boot—it’s a simple cloud storage locker in the old sense of the term: It holds your files in the cloud cheaply and that’s about it. As an add-on to Prime then fine, but we’d struggle to see why anyone would use Amazon Cloud Storage over the other options here if they want to do more than just archive data on the web. The apps are ponderous in operation, rudimentary in looks, and sparse in features—file version history (keeping older versions of files), for example, comes as standard in other services but is nowhere to be found in Amazon’s. Pros: low prices and extras for Prime members. Cons: unpolished apps, zero goodies like office suites or photo editing. As you might expect, Google Drive is the smoothest service when it comes to actual web access: opening up files, streaming files, converting files, editing files, and collaborating using the built-in Docs, Sheets, and Slides tool. Chrome OS relies on a solid cloud storage system, and that’s exactly what Google Drive is. Thankfully, the desktop clients just got a bit more polish with the addition of the new Backup & Sync tool. In terms of desktop clients, it’s probably the easiest one to use in this list bar maybe Dropbox. It’s Google Photos and Google Play Music where the real standout benefits lie. They might not technically be part of Google Drive, but they’re so closely linked you can’t really consider them separately either. Google Photos is by far the best photo organization and syncing tool out there, from the way it tags and searches photos to the unlimited free storage it offers if you don’t mind a 16 megapixel maximum size for your photos and a 1080p maximum resolution for your videos. It’s difficult to recommend anything else unless you’re really heavily invested in Apple’s ecosystem. Google Play Music isn’t quite as impressive, but still stores 50,000 of your tracks free of charge and will stream and sync them anywhere you like. That’s an awful lot of photo and music storage and features for free, with smart and intuitive apps to boot. Perhaps it’s cheating to bundle in those extras in Google Drive, but the main app considered on its own is still clean and stable and user-friendly, even if it doesn’t quite have the sophistication of Dropbox in the file syncing and management departments. Dropbox has been at this game a long, long time, and it shows—while Google, Apple, and Microsoft feel like they’ve caught up in terms of features and functions, the intuitiveness and look of Dropbox’s apps still give the service an edge. Not only that, but the apps are more reliable and faster too. They’re updated more often and more consistently across multiple platforms, and if you want best-in-class syncing and backup then this is the place to find it. Handy features like version history and file undelete aren’t exclusive to Dropbox, but they feel easy to find and easy to use here, without having to delve into help files and online tutorials. To borrow a phrase from Apple, it just works, which might be why Steve Jobs was interested in acquiring Dropbox in its early days. File and folder sharing is another plus, giving you a variety of ways to share files on the web or through the apps, with very useful features like editing controls and expiry dates for links just a few clicks away. So what are the downsides? The service could use a bit of variety in its pricing and storage plans (and 2GB isn’t much room for free), and Dropbox Paper is a slick web tool, but it can’t compete against the online office suites offered by Microsoft, Google, and Apple. Though, thanks to a partnership with Microsoft, you can now open and edit Office files in your browser. Yet that feature feels a little tacked on. Meanwhile, photo, music, and video management is basic and largely uninspiring: Dropbox doesn’t have much in the way of tools for organizing your media, though you can, for example, stream videos, regardless of length, straight from your Dropbox. If your focus is on your files—syncing, sharing, and viewing them across multiple platforms—then Dropbox is difficult to beat. The areas where it isn’t so strong are the extra bells and whistles that you might not need anyway. Pros: file syncing, file sharing, cross-platform support. Cons: Less than robust online office suite, uninspiring photo, music, and video management. All your files and photos and music appear on all your Apple devices as if by magic and the vast majority of the reliability problems and software bugs that plagued iCloud in the beginning have now been ironed out from what we can tell. Plus, iWork for iCloud is now a more competent online office suite than a lot of people give it credit for, complete with sharing and collaboration options, templates, and an interface that’s actually fast and responsive as you move around it. As much as it’s improved, iCloud does have some gaps in its functionality: You can’t view most files on the web unless they’re from Apple apps, so PDFs and videos, for example, have to be downloaded rather than streamed or viewed. It’s little annoyances like this that put Google Drive and Dropbox a step ahead. Then there’s cross-platform support—limited and fiddly on Windows, and almost non-existent for Android. Like Google, Apple has separate iCloud components for music and photos, and in the case of the iCloud Music Library locker you can store 100,000 tracks without it counting against your storage, which is double Google’s offering. You can even get those tunes on Android, if you pay an extra $9.99 for Apple Music. The 2017 edition of iCloud looks good and works well, and with a little more web savviness and better support for Android and Windows, Apple could seriously challenge Google and Dropbox. As it is, it’s only users who like to go all-in with Apple that are going to prefer this above all the other contenders. Pros: can store up to 100,000 songs that work seamlessly with iTunes, works with existing Apple products. Cons: can’t view many files on the web, limited multi-platform support. On paper, you’d say Microsoft has caught up to the likes of Dropbox and Google Drive with its OneDrive (previously SkyDrive) offering; in reality, it’s still a lot clunkier to use. The integrated syncing feels shoehorned into Windows 10, and the online apps feel like desktop programs shoehorned into a web browser. Actually, it’s not as bad as that sounds. If you only use Windows and you’re too lazy to switch to anything else then OneDrive will suit you just fine and cover all of the basics of syncing files between computers and keeping copies in the cloud. To no one’s surprise, Microsoft is trying to leverage the power of the bundle to get people to use OneDrive—stump up $70 a year and not only do you get 1TB of OneDrive space, you also get Office 365 (for the desktop) thrown in as well, which suddenly makes the deal look a lot more appealing. Microsoft is having a stab at keeping up with Google in terms of organizing your photos, and it even tries to auto-tag them these days, but again while the two services look similar in terms of a simple feature-to-feature comparison, Google’s head start shows in how speedy and intuitive its online apps are. It’s the same with other features, like version history and document collaboration—they’re here, but they’re not particularly pleasant to use. You do get clients for macOS, Android, and iOS with OneDrive, so you can take it with you to other devices, but we’d only recommend you spend your monthly cloud storage allowance on this if you live and breathe Windows and Microsoft Office and need the option that works most seamlessly with Microsoft’s existing products. Pros: works with other Microsoft products. Cons: works poorly with everything else.